Using the development of symbolism described in the previous post, create an image (use any media~collage, photos, pencil, crayons,etc.) that shows how you spent the holidays 2014-2015. It is normal if this process brings about some melancholy and some joy at the same time. 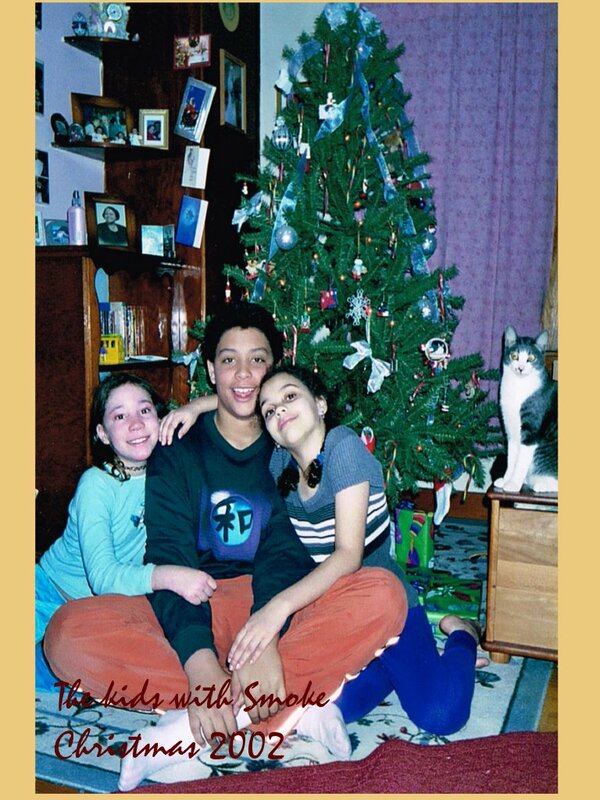 You may even find yourself expanding the project to include images from Christmas Past. If you do so, why not also add images from your Christmas Future? This is written from my perspective as a person who celebrates Christmas and New Years as a time for gathering with close friends and family and a time for personal renewal. If you are NOT one who celebrates Christmas per se, use images, concepts, and experiences from a time in your life that best helps you express these similar gatherings.Use the Registration Form if you would like this work to be included in the FIRST Art For Arachnoiditis Project Public Exhibit. Farewell to our furry friend. Smoke, would have been 14 in February. He died on New Year’s Eve. Celebrating Christmas with my children and my grandson and my significant -other (ALL of them were able to get home at the same time this year!) was an amazing, hectic, joyous experience. With it comes the aftermath of domestic chores…which inevitably lead to remembering the ones that I had been procrastinating in order to make art. The sudden loss of our last cat, Smoke, set off a flurry of transition in my live/ work studio space. It has been over 20 years since we have been cat-less. It is strange to be so now. However, given the limitations and restriction of arachnoiditis, it would be unfair and selfish of me to bring another animal into such an unpredictable environment with so few resources. The last few weeks have been all about clearing that board of chores and tasks, so-to-speak… Making room for being creative again. The FLOW: 30 Day Journal project is helping me to work through some of the tasks: physical, mental, emotional, spiritual, financial, that I need to resolve in order to resume my creative work in the studio and the Arachnoiditis Survivor Portraits. I am hoping that taking the time to do these things will result in quality work without detriment to the over-all project and our fast-approaching deadlines. As an Arachnoiditis Survivor, what gets in your way of making art? of creating? Even if you don’t consider yourself an “artist” this question pertains to you. The benefits of the creative process are not limited to visual and performing arts. “Planning HOW I will share the work with others seems to get in the way the most. How will I record the portraits for the Arachnoiditis Survivors as they are being made so that the Survivors can be included in this process? This has been a technical challenge and frustration since the launch of the Art For Arachnoiditis Project. The recording process interrupts the creative process and I lose my smooth focus and flow. Technical issues make it a fragmented process jumping from paper and pencil to editing video & audio and sharing & posting when my natural approach is to draw until I reach a comfortable stopping point. This is a true stretch of my natural rhythm of creativity. In order to accommodate arachnoiditis in the studio, I have created multiple work stations and change position frequently. So, in many ways this NEW process feeds into that and supports that. I am consoling myself with the reminder that the intention of THIS project is to empower other survivors via participation…inclusion and community are key…The completed conceptual portrait is only ONE portion of the full creative process. It is NOT the MAIN objective. This is a difficult thing to remember. The HOW of sharing the art often gets in my way with other more direct, canvas, gesso, paint, hang projects. I continue to struggle with ways to make my work (and the process) accessible to others. This particular post/prompt is helping me work through some of my mental blocks about that. I am coming to realize that there are easier ways to make this happen. I love sharing my work with others.I have very few qualms about that. It’s figuring out the logistics of that which gets in my way. So, I will be trying to focus more on making-with-intent-to-share included in the process…instead of letting it be a task/plan I MUST conquer BEFORE I can create. Today’s post, Out With The Old In With the New, tells more about these processes in the studio.